Dear Members of "The Swiss Business Council- Lebanon"
1- Acknowledge the cash flow statement of the association for the year 2013, and the 2014 budget. 2- To release the actual Administrative Board. 3- To elect the new Administrative Board of nine members and three substitute members. Please note that you should settle your annual dues to the Association one week prior to the date of the meeting of the General Assembly, i.e. prior to 10/5/2014. In case the quorum is not met in the first meeting , the General Assembly shall be deemed convened de facto at 11:30 o'clock and the meeting will take place with the attendees only no matter their number. 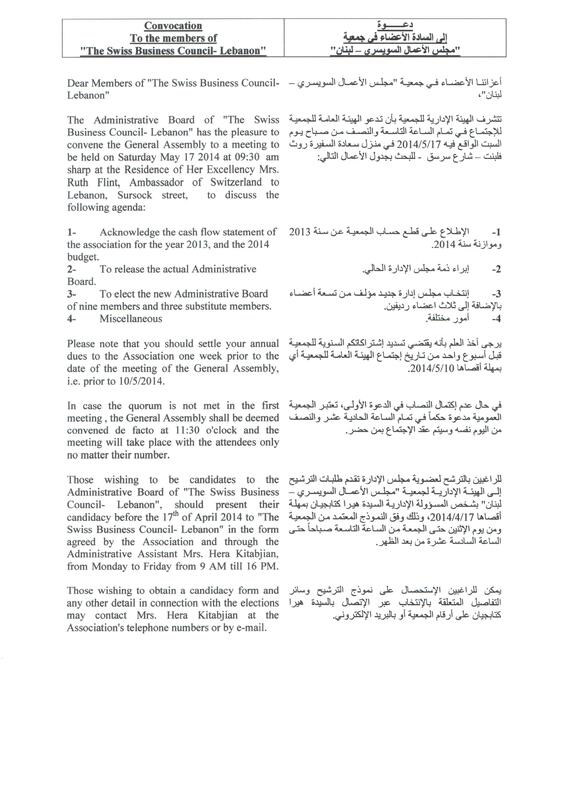 Those wishing to be candidates to the Administrative Board of "The Swiss Business Council- Lebanon", should present their candidacy before the 17th of April 2014 to "The Swiss Business Council- Lebanon" in the form agreed by the Association and through the Administrative Assistant Mrs. Hera Kitabjian, from Monday to Friday from 9 AM till 16 PM. Those wishing to obtain a candidacy form and any other detail in connection with the elections may contact Mrs. Hera Kitabjian at the Association's telephone numbers or by e-mail.